RAID stands for Redundant Array Of Independent Disks.Originally is was known as Redundant Array Of Inexpensive Disks. 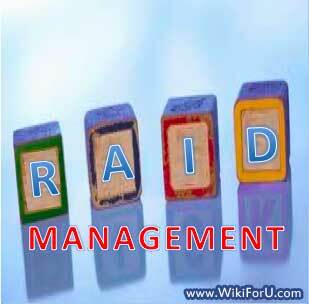 RAID management is a storage technology that combines multiple disk drives into logical units. RAID is a disk management tool which works with most of the operating systems like Windows, Macintosh and Linux. It is a special kind of method which uses drive signature. Disk Drives are configured as dynamic disks for implementation of RAID management which enables us to enlarging a partition without deleting it or losing its data. RAID management can be considered as an example of storage virtualization and the operating system can access array by the one single drive. RAID can be implemented as Hardware or Software solution. RAID is classified in six levels i.e. from RAID 0 to RAID 5. RAID 0: Is provides improvement in performance and additional storage. But it does not provides any fault tolerance. RAID 1: It implements Disk Mirroring. It makes a copy of the same data or information on both the disks so that in case of failure of one disk, the other disk can be used as backup. In new systems Disk Duplexing takes place of this. RAID 2: It uses Error correction for verifying the data and then writes the data into disks. Hamming code parity is used as an Error Detection Technique. RAID 3: It uses three disks from which one disk saves error correction specs and strips data on other two disks. RAID 4: It is same as RAID 3 except it has four disks from them one is used for storing error correction specifications while other three for stripped data. RAID 5: Is is also almost same as above two RAID 3 and 4. But it has 5 disks and uses all of them for stripping data. Disk Mirroring is a fault tolerance method which simultaneously writes the same information on various hard disks using same disk controller. This is very good method as if one of them disks got crashed or does not work then the data can be retrieved from the other disk and the work will be continued without any delay. So it is useful when any of the disks got crashed. Disk Mirroring is provided by the most NOS that is Network Operating Systems. Disk Mirroring is pretty useful in case of disk crashes or non availability of a disk. But when two or both of the disks are fail or crashed then it is not any useful because then there will be no substitute for getting data.